Objective Campylobacter jejuni produces a genotoxin, cytolethal distending toxin (CDT), which has DNAse activity and causes DNA double-strand breaks. Although C. jejuni infection has been shown to promote intestinal inflammation, the impact of this bacterium on carcinogenesis has never been examined. Design Germ-free (GF) ApcMin/+ mice, fed with 1% dextran sulfate sodium, were used to test tumorigenesis potential of CDT-producing C. jejuni. Cells and enteroids were exposed to bacterial lysates to determine DNA damage capacity via γH2AX immunofluorescence, comet assay and cell cycle assay. To examine the interplay of CDT-producing C. jejuni, gut microbiome and host in tumorigenesis, colonic RNA-sequencing and faecal 16S rDNA sequencing were performed. Rapamycin was administrated to investigate the prevention of CDT-producing C. jejuni-induced tumorigenesis. Results GF ApcMin/+ mice colonised with human clinical isolate C. jejuni81–176 developed significantly more and larger tumours when compared with uninfected mice. C. jejuni with a mutated cdtB subunit, mutcdtB, attenuated C. jejuni-induced tumorigenesis in vivo and decreased DNA damage response in cells and enteroids. C. jejuni infection induced expression of hundreds of colonic genes, with 22 genes dependent on the presence of cdtB. The C. jejuni-infected group had a significantly different microbial gene expression profile compared with the mutcdtB group as shown by metatranscriptomic data, and different microbial communities as measured by 16S rDNA sequencing. Finally, rapamycin could diminish the tumorigenic capability of C. jejuni. Conclusion Human clinical isolate C. jejuni 81–176 promotes colorectal cancer and induces changes in microbial composition and transcriptomic responses, a process dependent on CDT production. C. jejuni produces a genotoxin, cytolethal distending toxin (CDT), which has DNA damage potential. C. jejuni infection has been shown to promote intestinal inflammation. C. jejuni promotes colorectal cancer through the genotoxic action of cdtB. Pharmacological inhibition of mammalian target of rapamycin signalling attenuates C. jejuni-induced carcinogenesis. Intestinal microbiota composition and transcriptome is influenced by the presence of CDT-producing C. jejuni. Our findings identify the carcinogenic ability of C. jejuni, demonstrate the key role of cdtB in this process and also provide a new therapeutic alternative to antibiotics to control C. jejuni-induced carcinogenesis. Colorectal cancer (CRC), with approximately 135 430 new cases and over 50 260 related deaths nationwide in 2017,1 is one of the most common and deadly malignancies in the USA. Substantial evidence points to an essential role of the intestinal microbiota in CRC pathogenesis.2–4 Various pathobionts and enteric pathogens have been associated with development of CRC, including Bacteroides, Fusobacterium, Salmonella, Escherichia and Campylobacter spp.5–8 Mechanisms by which bacteria influence CRC development include promoting an inflammatory environment, production of molecules affecting DNA stability and alteration of proliferative responses.4 For example, the pathogenic gene island pks, present in certain Escherichia coli in group B2 and responsible for the synthesis of the secondary metabolite colibactin, is critical for CRC development in Il10-/- and ApcMin/+;Il10-/- mice and requires an inflammatory milieu to promote carcinogenesis.9–11 Moreover, microbial-derived toxins may have a synergistic effect on carcinogenesis as recently demonstrated by the high prevalence of E. coli-derived pks and Bacteroides fragilis-derived bft in patients with familial adenomatous polyposis.12 Another bacterial genotoxin is cytolethal distending toxin (CDT), produced by selective enteric pathogen strains such as Salmonella, Escherichia and Campylobacter spp.13–15 The genotoxin CDT is composed of three subunits CdtA, CdtB and CdtC, with CdtB carrying a DNase I-like property and the ability to induce host DNA damage. Host responses to Campylobacter infection have been mostly characterised at the immunological level, especially intestinal inflammation.19 20 In addition, gnotobiotic technology applied to Il10-/- and wild type (WT) mice showed the human clinical isolate C. jejuni 81–176 induced intestinal inflammation in the former strain.21 Subsequent studies showed that innate immunity was critical for C. jejuni-induced colitis as inflammatory response was similar between Il10-/- and Il10-/-;Rag2-/- mice.22 In addition, phosphatidylinositol 3-kinases γ (PI3Kγ) signalling-mediated neutrophil migration into colonic tissues is essential for C. jejuni-induced colitis.22 Mammalian target of rapamycin (mTOR), a downstream target of PI3K, has been implicated in many cellular functions, including cell growth, proliferation and survival. Interestingly, we previously showed that rapamycin ablated the ability of C. jejuni to promote intestinal inflammation, without decreasing Campylobacter colonisation levels in the intestine.23 These findings highlight the important role of mTOR and innate myeloid cells in C. jejuni-induced colitis. We recently showed that Il10-/-; ApcMin/+ mice and ApcMin/+ mice failed to develop CRC when housed under germ-free (GF) conditions, but were sensitive to the presence of a complete biota or selective bacteria, suggesting a complex interaction between microorganisms and carcinogenesis.11 Therefore, this animal model represents a unique tool to investigate relationship between genotoxic-carrying bacteria and CRC development. Here, we report that the human isolate C. jejuni 81–176 induces DNA damage and promotes colorectal tumorigenesis in GF ApcMin/+ mice, through the action of cdtB. Importantly, C. jejuni infection greatly modifies microbiota composition and gene expression, whereas alteration in host gene expression was minimal. Finally, the mTOR inhibitor, rapamycin, alleviates C. jejuni-induced colorectal tumorigenesis and tumour growth in ApcMin/+ mice. To assess a potential link between Campylobacter and CRC in humans, we retrieved mucosal 16S rRNA gene sequences from samples taken at different stages of tumorigenesis.24 We reanalysed the data and confirmed a significantly higher abundance of Campylobacter in both carcinoma and its adjacent tissue compared with normal tissue (online supplementary figure 1). To define the tumorigenic potential of C. jejuni, mice naturally acquiring specific-pathogen-free (SPF) microbiota were used as control group since we observed no difference between gavaged or naturally acquired biota (online supplementary figure 2). GF ApcMin/+ mice were transferred to an SPF environment, and orally infected with human clinical isolate C. jejuni 81–176 (105 colony forming unit (cfu)/oral gavage) or phosphate buffer saline (PBS) alone (control group). Mice were euthanised 3 weeks post dextran sulfate sodium (DSS) treatment as illustrated in figure 1A. Colonoscopy revealed presence of large tumours in the distal colon of C. jejuni-infected mice (figure 1B). On euthanasia, the colons of C. jejuni-infected mice displayed increased tumour numbers compared with the control group (figure 1C–E). Enumeration of tumours in both groups showed a significantly higher number of tumours (10.7 vs 4.0, p=0.025) and with a higher percentage of large tumours (percentage of tumours with diameter ≥3 mm: 77% (54/75) vs 43% (9/21), p=0.013) in C. jejuni-infected mice compared with the control group (figure 1E, online supplementary figure 3A). Interestingly, there was no significant difference in histological inflammation between mice in the C. jejuni-infected group and control group (figure 1F, online supplementary figure 3B). 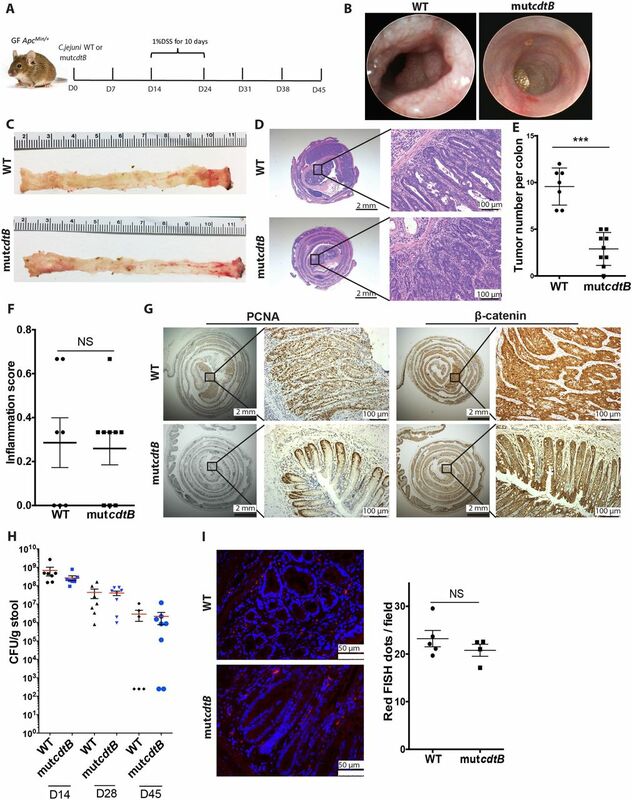 However, increased presence of proliferating cell nuclear antigen (PCNA) and nuclear β-catenin were observed in colonic mucosa from C. jejuni-infected mice compared with those from control mice (figure 1G). 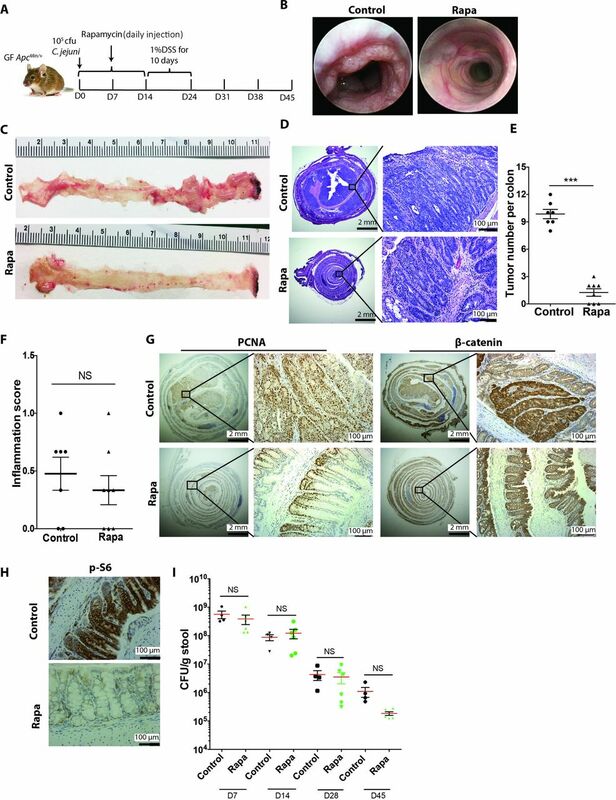 Taken together, these data suggest that human clinical isolate C. jejuni 81–176 promotes colorectal tumorigenesis in mice. Human clinical isolate C. jejuni 81–176 promotes colorectal tumorigenesis and tumour growth in mice. (A) Schematic diagram showing the experimental design for colorectal cancer (CRC). A cohort of GF ApcMin/+ mice (n=5–7) were transferred to a specific-pathogen-free (SPF) environment and immediately gavaged with a single dose (105 CFU) of C. jejuni (or PBS in control group). After 14 days, the mice were exposed to 1% dextran sulfate sodium (DSS) for 10 days and euthanised 3 weeks post-DSS. (B) Representative colonoscopy, (C) macroscopic morphologies and (D) H&E-stained colon sections of mice in control and C. jejuni groups. (E) Macroscopic colon tumour counts from mice in control (n=5) and C. jejuni (n=7) groups. (F) Histological inflammation score and (G) proliferating cell nuclear antigen (PCNA) and β-catenin immunohistochemistry (IHC) from mice in control and C. jejuni groups. Data, mean±SEM. Mann-Whitney U test. *p<0.05; GF, germ-free; NS, not significant. C. jejuni CdtB subunit is critical for DNA damage in vitro. IEC-6, HT-29 and mouse enteroids were exposed to bacterial lysates from C. jejuni-wild type (WT) or mutcdtB. Cells were incubated with lysates (5 µg/mL) or PBS for 24 hours for γH2AX staining and comet assay, or 48 hours for cell cycle analysis. Enteroids were incubated with lysates (50 µg/mL) for 12 hours. (A) Representative images of γH2AX immunofluorescence staining, (B) γH2AX flow cytometry histograms, (C) comet assay and (D) cell cycle histograms showing IEC-6 cells (left panel) and HT-29 cells (right panel) treated with PBS (control), or lysates from C. jejuni or mutcdtB. (E) Representative images of γH2AX immunofluorescence staining in enteroids incubated with PBS (control) or bacterial lysates. At least four independent experiments were performed. Data, mean±SEM χ2 test. ****p<0.0001; NS, not significant. C. jejuni-induced tumorigenesis in ApcMin/+ /dextran sulfate sodium (DSS) mice and requires functional cdtB. (A) Schematic diagram showing the experimental design. A cohort of germ-free (GF) ApcMin/+ mice (n=7–9) was transferred to a specific-pathogen-free (SPF) environment and immediately gavaged with a single dose (105 CFU) of C. jejuni (wild type (WT) or mutcdtB). After 14 days, the mice were exposed to 1% DSS for 10 days and euthanised 3 weeks post-DSS. (B) Representative colonoscopy images, (C) macroscopic morphologies and (D) H&E-stained colon of mice infected with C. jejuni-WT or mutcdtB. (E) Macroscopic tumour counts from mice in C. jejuni-WT group (n=7) and mutcdtB group (n=9). (F) Histological inflammation score and (G) proliferating cell nuclear antigen (PCNA) and β-catenin immunohistochemistry (IHC) from mice in C. jejuni-WT group and mutcdtB group. (H) CFU counts of C. jejuni in the stool of mice colonised with C. jejuni-WT and mutcdtB at different time points. (I) Presence of C. jejuni (red dot) in colonic sections from infected mice at the end point of experiment, detect by fluorescence in situ hybridisation (FISH) assay. Data, mean±SEM Mann-Whitney U test. ***p=0.0002; NS, not significant. To define the mechanism of C. jejuni-induced colorectal tumorigenesis, we engineered a cdtB mutant C. jejuni 81–176 strain (mutcdtB) by electroporating an inactivated cdtB allele into the C. jejuni 81–176 WT strain (C. jejuni-WT) (online supplementary figure 4). To test the effect of C. jejuni mutcdtB (C. jejuni 81–176 harbouring cdtB mutant allele) on DNA damage, we prepared bacterial lysates from C. jejuni-WT and C. jejuni mutcdtB and exposed a non-transformed rat small intestine epithelial cell line IEC-6, and human colon cancer cell line HT-29, to these extracts (5 ng/mL) for 24 hours. Extracts from C. jejuni increased phosphorylation of histone H2AX (γH2AX), a surrogate marker for DNA damage, in both IEC-6 and HT-29 cells when compared with untreated cells (figure 2A). Interestingly, γH2AX induction was attenuated in cells exposed to lysates generated from C. jejuni mutcdtB (figure 2A). 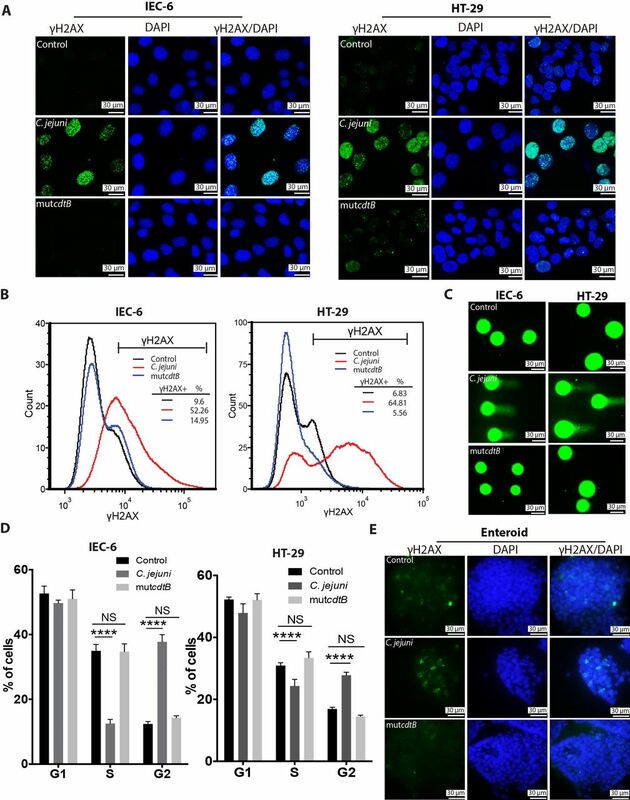 Flow cytometry quantification revealed a decrease in γH2AX staining of ~70% in IEC-6 cells and ~90% in HT-29 cells exposed to lysates from C. jejuni-WT when compared with cells exposed to C. jejuni mutcdtB lysates (figure 2B). Moreover, measuring DNA damage via comet assay showed that while bacterial lysates from C. jejuni-WT promote DNA damage, this response was strongly attenuated in cells exposed to lysates from C. jejuni mutcdtB (figure 2C). Finally, cell cycle analysis by flow cytometry revealed that while C. jejuni-WT promotes G2/M cell cycle arrest, cells exposed to extracts from C. jejuni mutcdtB fail to generate a similar response (figure 2D). In addition, we used cultured enteroids to further evaluate the effect of cdtB on DNA damage in primary intestinal cells. Exposure of enteroids to C. jejuni lysates enhanced γH2AX induction compared with control, while this response was attenuated in enteroids exposed to C. jejuni mutcdtB (figure 2E). Finally, to confirm the genotoxic activity of C. jejuni depends on cdtB DNAse activity, we compared the cellular defects induced by recombinant CDT holotoxins composed of WT or the catalytically dead H152A CdtB mutant. Each CDT subunit was purified to near homogeneity (online supplementary figure 5A) and reassembled in active toxins. Importantly, exposure of HT-29 and IEC-6 cells to reconstituted WT CDT increased γH2AX compared with untreated control cells (online supplementary figure 5B). CDT-induced γH2AX modification was lost when Cdt holotoxin contained the H152A CjcdtB subunit (online supplementary figure 5B). These findings demonstrate that cdtB plays an important role in C. jejuni-induced DNA damage and cell cycle arrest in vitro. Cytolethal distending toxin (CDT)-producing C. jejuni impacts mouse and bacterial transcriptomes. RNA from distal colon tissues of mice infected with C. jejuni-wild type (WT) (n=3), mutcdtB (n=3) and controls (n=3) were subject to RNA-seq. Principal component analysis (PCA) comparing mouse transcriptomes between (A) C. jejuni group and control group, (B) mutcdtB group and control group and (C) C. jejuni group and mutcdtB group. PCA comparing bacterial transcriptomes between (D) C. jejuni group and control group, (E) mutcdtB group and control group and (F) C. jejuni group and mutcdtB group. Cytolethal distending toxin (CDT)-producing C. jejuni alters microbial compositions. DNA from stool samples collected at 14 days and 45 days following infection with C. jejuni-wild type (WT) (n=7), mutcdtB (n=7) and uninfected controls (n=5) were subjected to 16S rDNA sequencing. Shannon Diversity Index comparing C. jejuni, mutcdtB and controls at (A) 14 days time point (control vs C. jejuni p value=0.15, control vs mutcdtB p value=2.20E-05 and mutcdtB vs C. jejuni p value=2.72E-05) and (B) 45 days time point (control vs C. jejuni p value=0.65, control vs mutcdtB p value=2.10E-07 and mutcdtB vs C. jejuni p value=5.14E-09). Principal coordinates analysis (PCoA) comparing microbial compositions in faecal samples at 45 days time point between: (C) C. jejuni group and control group, (D) mutcdtB group and control group, and (E) C. jejuni group and mutcdtB group. (F) Heat map representation of families significantly different (FDR-adjusted p value<0.05) between mice infected with C. jejuni, mutcdtB and controls at (F) 14 days time point and (G) 45 days time point. ****p<0.0001; NS, not significant. To evaluate the role of cdtB in C. jejuni-induced tumorigenesis in vivo, we transferred GF ApcMin/+ mice to the SPF environment, infected them with C. jejuni-WT or C. jejuni mutcdtB via oral gavage (105 cfu/mouse) and assessed tumour development (figure 3A). Colonoscopy showed that tumour numbers and sizes were reduced in the distal colons of C. jejuni mutcdtB-infected mice compared with C. jejuni-WT-infected mice (figure 3B). On euthanasia, the colons from C. jejuni mutcdtB-infected mice displayed a reduced number of tumours compared with the colons from C. jejuni-WT-infected mice (figure 3C–E). Enumeration of tumours in both groups showed C. jejuni mutcdtB-infected mice had significantly fewer tumours (2.9 vs 9.6, p=0.0002) with a smaller percentage of ≥3 mm diameter large tumours (15.4% vs 58.2%, p<0.0001) compared with mice infected with C. jejuni-WT (figure 3E, online supplementary figure 6A). 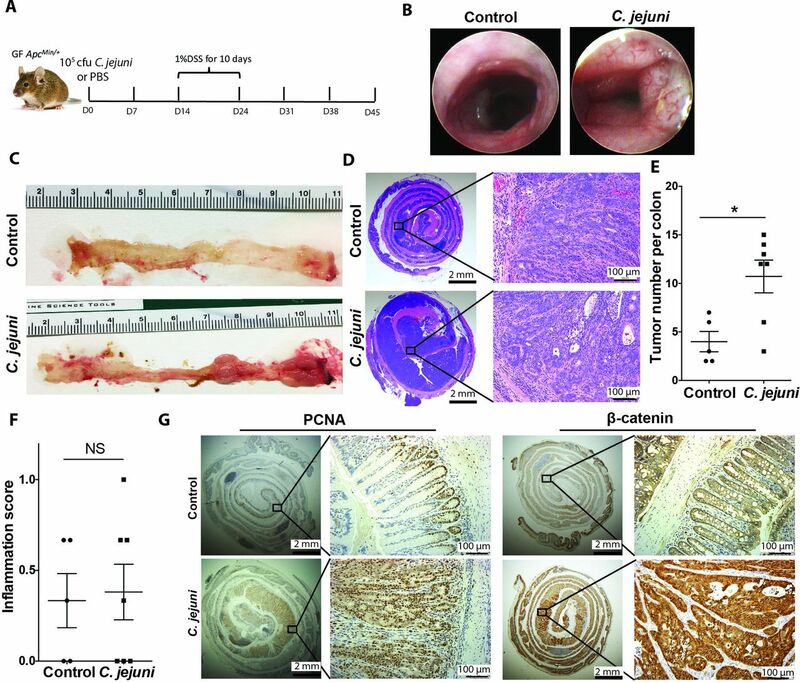 Concomitant to this phenotype, the colonic mucosa of C. jejuni mutcdtB-infected mice showed attenuated levels of proliferating cell nuclear antigen (PCNA) and nuclear β-catenin compared with mice infected with C. jejuni-WT (figure 3G). Importantly, cdtB mutation did not impair the colonic inflammation, colonisation and invasion ability of C. jejuni in vivo (figure 3F,H,I, online supplementary figure 6B), suggesting that decreased tumorigenic ability of C. jejuni mutcdtB was not due to impaired bacterial colonisation or decreased colitis. Overall, these data indicate that cdtB is critical for C. jejuni-induced tumorigenesis in vivo. Rapamycin alleviates C. jejuni-promoted colorectal tumorigenesis and tumour growth in ApcMin/+ /dextran sulfate sodium (DSS) mice. (A) Schematic diagram showing the experimental design. Cohorts of germ-free (GF) ApcMin/+ mice (n=7–8) orally infected with C. jejuni (105 CFU) were intraperitoneally injected with rapamycin (1.5 mg/kg body weight, daily) for 14 days, and subsequently exposed to 1% DSS for 10 days. Three weeks post-DSS, the mice were euthanised. (B) Representative colonoscopy images, (C) macroscopic morphologies and (D) H&E staining sections from colons of mice in control group (n=7) and rapamycin group (n=8). (E) Macroscopic tumour counts of mice in control group and rapamycin group. Two independent experiments were performed. (F) Histological inflammation score, (G) proliferating cell nuclear antigen (PCNA) and β-catenin immunohistochemistry (IHC) and (H) p-S6 (S235/236) IHC from mice in control group and rapamycin group. (I) CFU counts of C. jejuni in the stool from mice in control group and rapamycin group at different time points. Data, mean±SEM Mann-Whitney U test. ***p=0.0003; NS, not significant. 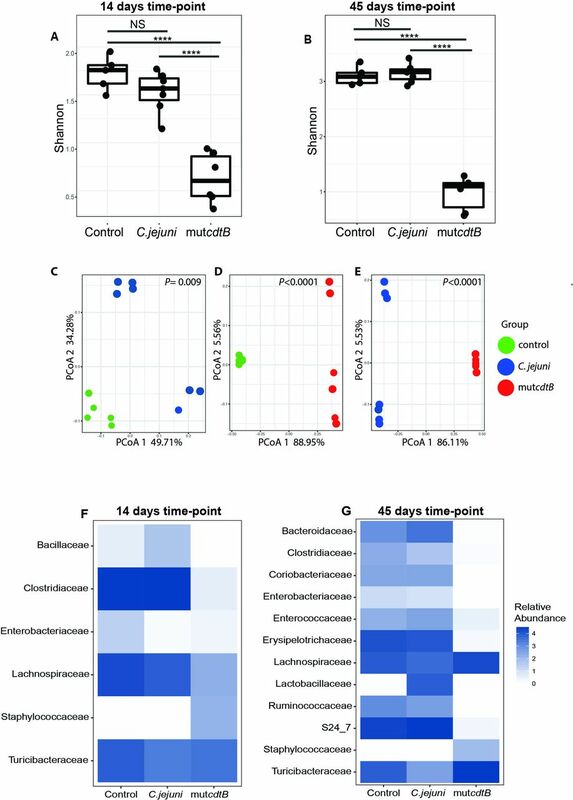 C. jejuni infection has been shown to alter luminal microbial composition in mice.25 Since microbiota composition and associated transcriptomic activity are important environmental factors in intestinal carcinogenesis, the impact of C. jejuni and its CDT toxicity was evaluated on both host and microbial gene expression. RNA was extracted from flanking normal distal colon tissues from control (n=3), C. jejuni-WT-infected (n=3) and C. jejuni mutcdtB-infected mice (n=3). Principal component analysis (PCA) revealed the mouse transcriptomes of C. jejuni-WT but not C. jejuni mutcdtB-infected mice were different from those of control mice (p<0.05) (figure 4A,B). Even though no significant difference was observed in mouse transcriptomes between C. jejuni-WT and C. jejuni mutcdtB-infected mice (figure 4C), we still observed 22 differentially expressed genes between C. jejuni-WT and C. jejuni mutcdtB-infected mice, with 15 upregulated and 7 downregulated genes in C. jejuni-WT-infected mice (online supplementary table 1). These genes were involved in chemotaxis (Cxcl1, Cxcl9 and Cxcl10), immunoglobulin production (Ighv1-39, Ighv1-81, Ighv6-3, Ighv7-3, Ighv8-12, Ighv14-3, Igkv1-110, Igkv8-27 and Igkv10-94) and anti-infection response (Gbp4, Tgtp1 and Tgtp2). Furthermore, Kyoto Encyclopaedia of Genes and Genomes pathway enrichment analysis showed two carcinogenic pathways were enriched in C. jejuni-WT-infected mice compared with control and C. jejuni mutcdtB-infected mice (online supplementary figure 7A,C). Peroxisome proliferator-activated receptors signalling pathway and calcium signalling pathway were significantly enriched among these groups (online supplementary figure 7A,C) but not C. jejuni mutcdtB-infected versus control mice (online supplementary figure 7B), indicating that the enrichment of these two carcinogenic signalling pathways could be due to the effect of cdtB. 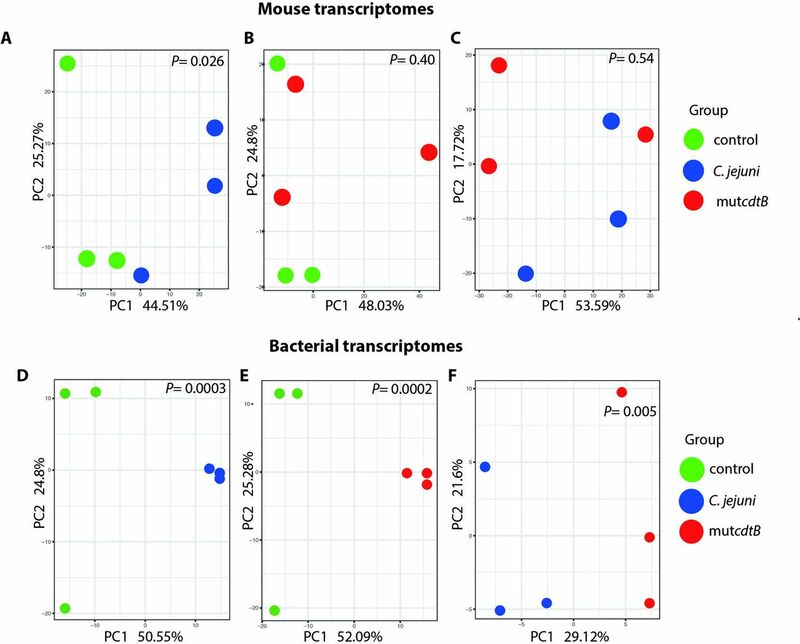 Although less than 1% of RNA sequences were attributed to microbial genes, we noticed that in contrast to mammalian transcriptomic responses, microbial transcriptomic profiles were significantly different between C. jejuni-WT and C. jejuni mutcdtB-infected mice (figure 4D–F), suggesting a higher sensitivity of microbiota to cdtB status. To investigate the interaction between C. jejuni and gut microbiota composition, we performed 16S rRNA gene sequencing using faecal samples collected from control, C. jejuni-WT and C. jejuni mutcdtB groups at 14 days and 45 days. Interestingly, absence of functional cdtB is associated with decreased microbiota diversity at both the early and late infection time points (figure 5A,B). Principal coordinates analysis (PCoA) showed that the compositions of microbiota in these three groups were significantly different when compared with each other (C. jejuni-WT vs control, p=0.009; C. jejuni mutcdtB vs control, p<0.0001; C. jejuni-WT vs C. jejuni mutcdtB, p<0.0001) (figure 5C–E). Importantly, colonisation with C. jejuni mutcdtB generally resulted in loss of numerous taxa in the luminal compartment compared with controls and C. jejuni-WT mice (figure 5F,G). Comparing microbiota compositions of C. jejuni mutcdtB group to C. jejuni-WT group, we found 70 operational taxonomic unit (OTUs) with different relative abundances, which included depletion of Enterococcaceae, S24-7, Erysipelotrichaceae, Clostridiaceae, Bacteroidaceae, Enterobacteriaceae, Lactobacillaceae, Ruminococcaceae and Coriobacteriaceae but enrichment of Staphylococcaceae, Turicibacteraceae and Lachnospiraceae in the mice infected with C. jejuni mutcdtB (all false discovery rate (FDR)-adjusted p<0.05) (figure 5F,G, online supplementary table S2). Overall, microbial composition and transcriptomes are sensitive to the presence of C. jejuni, with some of these changes under the influence of cdtB. Collectively, C. jejuni infection changes gene expression profiles in the host but has a higher impact on the microbial transcriptome during CRC. C. jejuni-induced colitis has been shown to be dependent on the activation of mTOR signalling in GF Il10-/- mice.23 26 Rapamycin has been shown to prevent tumour development in different animal models including ApcMin/+ mice.27 Similarly, we confirmed that rapamycin decreases tumour number in our DSS/ApcMin/+ mice (online supplementary figure 8B). To explore the impact of mTOR signalling on C. jejuni-induced carcinogenesis, GF ApcMin/+ mice infected with C. jejuni were intraperitoneally injected with rapamycin (1.5 mg/kg body weight) daily for 14 days and subsequently exposed to 1% DSS for 10 days, after which mice were euthanised 3 weeks post-DSS treatment (figure 6A). Colonoscopy demonstrated less visible tumours were found in rapamycin-treated mice compared with rapamycin-untreated control mice (figure 6B). The colons of rapamycin-treated mice showed reduced tumorigenesis compared with control group (figure 6C–E). Enumeration of tumours showed significantly lower numbers of tumours (1.3 vs 9.9, p=0.0003, figure 6E) with a lower percentage of large tumours (diameter ≥3 mm: 10% (1/10) vs 60.9% (42/69), p<0.0001, online supplementary figure 9A) in rapamycin-treated mice compared with the control group. Rapamycin did not affect the severity of colon inflammation (figure 6F, online supplementary figure 9B). Importantly, rapamycin attenuated the levels of PCNA and nuclear β-catenin in the colonic mucosa (figure 6G). These effects correlated with lower p-S6 (S235/236) levels, a downstream target of mTOR signalling in colonic tissues of rapamycin-treated mice (figure 6H). In addition, consistent with a previous report,22 rapamycin did not affect C. jejuni luminal colonisation levels (figure 6I). Collectively, these findings demonstrate that C. jejuni promotes tumorigenesis in ApcMin/+ /DSS mice through the action of CdtB, a process under the control of mTOR signalling. The presence of the virulence factor CDT in some Campylobacter species including C. jejuni was reported 20 years ago.13 Since this genotoxin is capable of inducing genome instability, it is intriguing that pathogenic potential of Campylobacter species has been exclusively investigated in the context of intestinal inflammation and extraintestinal comorbidities. To our knowledge, no studies have addressed the relationship between Campylobacter species and development of CRC. In this study, we established the protumorigenic effect of C. jejuni in the colon and demonstrated a key role of CDT in this phenotype. Importantly, we showed that C. jejuni-induced carcinogenesis is accompanied by changes in the microbiota transcriptional profile, a process dependent on a functional CDT. Finally, our data highlighted the requirement of mTOR signalling in C. jejuni-induced carcinogenesis. Together, our findings demonstrate the carcinogenic potential of C. jejuni and the key role of CDT in this process. A number of studies have reported an association between Campylobacter relative abundance in tumour tissues and stool samples from patients with CRC and development of CRC.5–7 In addition, we retrieved mucosal 16S rDNA gene sequences from a publicly available database and confirmed that Campylobacter spp was enriched in CRC tissues and their adjacent normal tissues compared with tissues from healthy controls.24 A study from a Swedish cohort found no significant difference in GI cancer risk between subjects diagnosed with C. jejuni infection and control subjects after ~7.6 years follow-up.28 However, it should be noted that the time period required for development of carcinoma from adenoma was conservatively estimated at approximately 10 years,29 thereby limiting any conclusion from epidemiological studies using a shorter timeline. The higher prevalence of Campylobacter spp in patients with CRC, in conjunction with the ability of C. jejuni to promote CRC in mice, calls for further investigation about the potential role of this bacterium in carcinogenesis. Our data highlight the key role of CDT in C. jejuni-induced carcinogenesis. Lysates from C.jejuni mutcdtB or purified mutated protein exhibited impaired DNA damage ability in vitro. Furthermore, infection with Cdt-mutant strain resulted in decreased tumour multiplicity and tumour growth concomitant with lower nuclear β-catenin accumulation and PCNA staining compared with C. jejuni-WT-infected ApcMin/+ /DSS mice. Cells exposed to DNA damaging agent such as CDT suffer extensive genetic modification that could cause apoptosis if these are too extensive. Therefore, cells that are allowed to resume cell cycle and proliferate were likely to carry a number of DNA alterations that were compatible with survival and oncogenic traits. Collectively, our findings suggest that CDT-producing C. jejuni induces DNA damage in host cells, stimulates cell proliferation and promotes nuclear translocation of β-catenin, thereby promoting colorectal tumorigenesis. The presence of CDT has been previously associated with carcinogenesis. For example, the prevalence of mucosal-associated E. coli-cdt obtained from biopsies of patients with CRC was higher than those from controls.30 Furthermore, the presence of cdt was important for Helicobacter hepaticus-induced hepatocarcinogenesis and intestinal tumorigenesis in mice.31 32 These findings together with our study strongly suggest that CDT is an important virulence factor implicated in carcinogenesis in preclinical models, and warrant investigation of the role of this genotoxin in human cancer. Dysregulated interactions between intestinal bacteria and the host are associated with a number of pathologies including CRC. Interestingly, despite no significant difference in host gene expression profiles at the PCA level between mice colonised with C. jejuni-WT and mutcdtB, microbial transcriptomic profiles were significantly different between those two groups. Furthermore, 16S rDNA gene sequencing data demonstrated that bacterial community composition was altered by the cdtB status of C. jejuni, which showed depletion of Enterococcaceae, S24-7, Erysipelotrichaceae, Clostridiaceae, Bacteroidaceae, Enterobacteriaceae, Lactobacillaceae, Ruminococcaceae and Coriobacteriaceae, but enrichment of Staphylococcaceae, Turicibacteraceae and Lachnospiraceae in C. jejuni mutcdtB-infected mice compared with WT-infected mice. This suggests that microbial abundance and function are more sensitive to the action of CDT than the host. The reason for this heightened response by the microbial compartment is unclear. Since inflammation was shown to impact microbial genes and function,10 one possible explanation could be the difference in the inflammatory environment triggered by C. jejuni mutcdtB and C. jejuni-WT. However, histological inflammation and host gene expression were not significantly altered by the presence of CDT, thereby pointing to another direction. It is possible that the presence of intestinal tumours creates an environmental condition permissive to microbial changes.8 However, microbial composition and diversity are still different between the control (low tumour burden, no C. jejuni infection) and C. jejuni mutcdtB (low tumour burden) infected mice, suggesting that tumour environment is unlikely to be responsible for the alterations in microbial composition. In addition, these findings also suggest that the effect of CdtB on carcinogenesis is uncoupled from alterations in microbiota composition. Because few reads from RNA-seq were attributed to bacteria, we were unable to assemble pathways and thus it is unclear whether cdt specifically impact microbial gene expression link to carcinogenesis. However, the small sample size of our cohorts might have limited our ability to detect distinct transcriptional clustering of C. jejuni-WT and mutcdtB-infected host. Future studies using a larger sample size will certainly help to discern transcriptional differences in relation to Cdt activity. Nevertheless, we conclude that Campylobacter-mediated intestinal carcinogenesis operates through cdtB-induced host DNA damage and not by synergistic changes in microbiota composition. Another important finding from our study is that rapamycin, an inhibitor of mTOR signalling, abrogates the ability of C. jejuni to promote CRC, independently of luminal C. jejuni colonisation level. We have previously shown that rapamycin prevented C. jejuni-induced intestinal inflammation in Il10-/- mice without affecting luminal abundance of the pathogen.23 This study, in conjunction with our current report, demonstrates tissue-associated C. jejuni, and not luminal levels, drives intestinal pathologies. Interestingly, anaerobic-derived bile acid metabolite deoxycholic acid (DCA) prevented C. jejuni-induced mTOR activation and tissue invasion in Il10-/- mice, thereby blocking intestinal inflammation in a manner similar to rapamycin.26 Previous studies showed that rapamycin inhibited cellular proliferation, β-catenin activation and colorectal tumorigenesis in an Apc-deficient mouse model.27 33 This observation is in line with our observation of reduced PCNA and β-catenin activation following rapamycin exposure. Because mice were treated with rapamycin for only 2 weeks prior to DSS exposure and development of colonic neoplasia, we speculate that the inhibitor attenuates carcinogenic pathways, and interferes with C. jejuni infection. Therefore, rapamycin is able to antagonise C. jejuni-induced carcinogenesis by two different mechanisms: (1) Interfering with infection,23 thus preventing Cdt-induced DNA damage. (2) Antagonising intrinsic carcinogenic pathways afforded by genetic predisposition (Apc). Although our model does not distinguish the role of C. jejuni in cancer initiation or progression, the accelerated tumours seen in genetically predisposed ApcMin/+ mice following infection suggest that this bacterium may contribute to tumour progression. Human studies would be needed in order to correlate tumour state with bacterial infection. Taken together, our data reveal that the human clinical isolate C. jejuni 81–176 induces DNA damage and promotes colorectal tumorigenesis and tumour growth through the action of CDT, a process dependent on mTOR signalling in ApcMin/+ mice. Although C. jejuni infection greatly alters mucosal microbiota composition and gene expression, these changes do not appear important for tumorigenesis. These findings extend our insights into the relationship between C. jejuni and CRC, pointing to possible future prevention approaches by manipulating mTOR signalling through microbial-derived factors. A 2.2 kb region of DNA containing the coding sequence of cdtABC was amplified by PCR and cloned into the BamHI site of pUC19 to create pDRH577. A 1.4 kb SmaI cat-rpsL cassette from pDRH265 was ligated into the EcoRV site within cdtB on pDRH577 to create pDRH264624. This plasmid was then electroporated into DRH212 (81–176 rpsL Sm) and transformants were selected on Mueller-Hinton agar with 10 ug/mL chloramphenicol.34 Transformants were screened by colony PCR with primers that flanked cdtB and the surrounding DNA sequence. When measured by gel electrophoresis, the amplified fragment from WT C. jejuni was 1.7 kb and the amplifed fragment from the cdtB mutant was 3.1 kb, verifying correct construction of the cdtB mutant-C. jejuni strain (mutcdtB) (online supplementary figure 3). GF ApcMin/+ mice (129/SvEv background, 7~10 weeks old, mixed gender) were colonised with C. jejuni 81–176 or cdtB mutant or mice-derived stock SPF microbiota via oral gavage (105 cfu/mouse) on the day of transfer to SPF conditions. Sham treatment consisted of PBS gavage. Two weeks later, these mice were given 1% DSS (Alfa Aesar) with molecular weight 40 kDa in the drinking water for 10 days. Tumour formation was monitored by colonoscopy. Three weeks post-DSS treatment, all mice were euthanised by CO2 asphyxiation. For the mTOR inhibition experiment, the mice were intraperitoneally injected with rapamycin (1.5 mg/kg rapamycin) daily for 2 weeks after oral infection with C. jejuni (105 cfu/mouse) or PBS. The colons were cut open longitudinally and macroscopic tumours were counted. The tumour size was measured by electronic digital calliper (Control company). Approximately 0.5 cm × 0.5 cm snips were taken from the distal colon, snap frozen in liquid nitrogen and stored at −80°C. The rest of the colonic specimens were Swiss-rolled, formalin-fixed and paraffin-embedded for histological examination. Sections of 5 µm were stained with H&E. Histological scoring of inflammation was performed blindly using a scoring system ranging from 0 to 4 as described previously23 and calculated as the average of the proximal, middle and distal colon region scores. Genomic DNA of C. jejuni was obtained from the CIRM Biological Resource Centre (INRA Nouzilly, France, catalogue number CIRMBP-977). C. jejuni Cdt genes were PCR-amplified as previously described.35 C. jejuni cdtA and cdtC fragments were inserted into pRSFDuet (Novagen) using BamHI and EcoRI, whereas the C. jejuni cdtB fragment was inserted using BamHI and HindIII (New England Biolabs). The plasmids containing C. jejuni cdt genes were individually transformed in E. coli NEB 5α (New England Biolabs), and nucleotide sequences from selected recombinant clones were determined. The H152A C. jejuni CdtB catalytic mutant was obtained from WT C. jejuni CdtB plasmid, using the Q5 site-directed mutagenesis kit (New England Biolabs) according to manufacturer’s instructions. DNA base substitutions were introduced by PCR using oligonucleotides forward 5’-TTTCAATATCGCTGCTTTAGCT and reverse 5’-AAAGCATCATTTCCATTGCG. Purification of each 6-His tagged C. jejuni Cdt subunit was performed in E. coli BL21 under denaturing conditions as previously described,36 with minor changes. Briefly, the insoluble fraction of IPTG-induced (isopropyl-β-D-thiogalactopyranoside) bacteria was resuspended in binding buffer (20 mM phosphate buffer pH 7.2, 0.5 M NaCl, 10 mM imidazole, 7 M urea) and incubated with Talon Metal Affinity Resin (Clontech) for 1 hour with gentle rotation at 4°C. The resin was washed three times with 15 mL of binding buffer and eluted with binding buffer supplemented with 60 mM imidazole. Protein concentration and purity was estimated by sodium dodecyl sulfate polyacrylamide gel electrophoresis (SDS-PAGE) using stain-free gel technology (Bio-Rad) and bovine serum albumin (BSA) standard range. Equimolar concentrations of purified C. jejuni CdtA, C. jejuni CdtB and C. jejuni CdtC were mixed to reassemble active holotoxins by dialysis (10 K molecular weight-cut off (MWCO) Dialysis cassettes, Thermo Scientific). Urea was removed gradually during dialysis by sequential changes of dialysis buffer that contained 5 mM, 3 mM, 1.5 mM and then 0 mM urea, to provide gradual refolding and holotoxin assembly. Finally, CDT holotoxins were dialysed three times in storage buffer (100 mM Tris HCl pH 7.5, 10% glycerol). Murine intestinal crypts were isolated using previously described methods with minor modifications and resuspended in a solution of 50% Matrigel (Corning #356231) in basal culture medium (BCM) as previously described.37 with minor modifications and resuspended in a solution of 50% Matrigel (Corning #356231) in BCM. Crypt solution (100 µl) containing approximately 300–500 crypts was deposited per well into a prewarmed 6-well culture plate, allowed to harden for 15 min at 37°C, and overlaid with prewarmed BCM+media, consisting of BCM supplemented with 50 ng/mL recombinant mouse EGF (R&D Systems #2028-EG), 50 ng/mL recombinant murine noggin (Peprotech #250–38) and 250 ng/mL recombinant mouse r-spondin 1 and CF (R&D Systems #3474-RS). Mature, budding enteroids were passaged as previously described and treated by addition of bacterial lysates (50 µg/mL) to crypt pellet.38 Organoids were collected after 12 hours treatment in cold PBS and fixed in 4% formaldehyde for 30 min on ice, permeabilised with 100% methanol for 10 min on ice, then blocked in a PBS+additive solution containing 5% normal goat serum and 1% BSA for 1 hour. These specimens were incubated overnight at 4°C with 1:500 rabbit phosphohistone H2A.X (Cell Signalling Technology #9718), then for 1 hour with Alexa Fluor 488 goat antirabbit secondary antibodies (Life Technologies #A-11034). Specimens were then counterstained with 1:5000 DAPI solution (ThermoFisher #62248) for 1 hour, mounted with Vectashield hard set mounting medium (Vector Laboratories #H-1400) in a fluorodish (World Precision Instruments FD35-100) and imaged using a Leica TCS SP5 confocal microscope. All statistical tests were described in figure legends and were performed using SPSS V.22, Microsoft Excel and Graphpad Prism V.6. All tests are two-tailed; p<0.05 was considered statistically significant. Parametrical tests were used only for normally distributed data, otherwise the Mann-Whitney U test was used. Equality of proportions was tested by the χ2 test. Detailed methods of bacteria strains and culture conditions, bacterial lysate preparation, RNA extraction and RNA sequencing, 16S rDNA sequencing, mouse RNA-seq analysis, metatranscriptome analysis, 16S rRNA gene sequencing analysis, C. jejuni colonisation in faecal samples, fluorescence in situ hybridisation, immunohistochemistry, comet assay, immunofluorescence detection of γH2AX in vitro, γH2AX flow cytometry and cell cycle analysis are in the online supplementary material available online. The authors thank the germ-free services division of University of Florida’s Animal Care Services for assistance with gnotobiotic experiments. The authors also thank the UF Molecular Pathology Core for their histology services and the UF Interdisciplinary Center for Biotechnology Research Gene Expression and Genotyping and NextGen DNA sequencing Cores for helping with the RNA-sequencing.
. Campylobacter jejuni causing flare-up in inflammatory bowel disease. Lancet 1980;2:919. Contributors Study concept and design (ZH, RZG, JC); Acquisition, analysis and interpretation of data (ZH, RZG, RCN, JLP, MWD, ST, BP, GM, JV, DRH); Drafting of the manuscript (ZH, RZD, JC); Statistical analysis (ZH, RZG, RCN, JLP, MWD, ST, BP, GM); Essential reagents (JV, DRH), Obtained funding (JC, DRH); Study supervision (JC). All authors reviewed and approved the manuscript. Funding This study was funded by the National Institute of Diabetes and Digestive and Kidney Diseases (R01DK073338), University of Florida Health Cancer Center (UFHCC) Funds and University of Florida Department of Medicine Gatorade Fund to CJ, UFHCC Funds to RZG, China Scholarship Council (CSC) funds to ZH and National Institute of Health R01AI065539 to DRH. The funders had no role in study design, data collection and analysis, decision to publish or preparation of the manuscript. Ethics approval All animal experiments were approved by the Institutional Animal Care and Use Committee of the University of Florida (Protocol #s: 20169606 and 201608025). Correction notice This article has been corrected since it published Online First. The co-first author statement has been added.